Q: How do I calculate the VAT included in the debtor and creditor control accounts? A: Control accounts for debtors and creditors are the full amounts including VAT (Value-Added Tax) that are owed from one party to another. Assuming VAT is 14%, to calculate the VAT portion you take the total of debtors or creditors and multiply by 14/114. Hope that helps and that you now understand how to calculate VAT! An item with a selling price of R234.50 ex VAT , was sold. Calculate both the full selling price and the VAT portion of the sale? Please assist I have vat output of R630,902.10 I need to determine the revenue. Inclusive tax is referring to an amount that includes the VAT. For example, debtors or creditors. Or the full cash paid for a purchase (including VAT). Or the full cash received for a sales (including VAT). Exclusive of tax refers to the actual sales figure or purchases figure - which excludes VAT. For example, Joe sells goods for $110 including VAT. He receives $110 in cash. This is the inclusive amount - includes VAT in it. The actual sales figure will exclude VAT. In this case it will be $100. The VAT is $10. It's at a rate of 10% in this example ($10/$100 sales value). FYI usually they will give you the VAT rate in the question. You just have to calculate either the exclusive or inclusive figure. I charged a vat inclusive hourly rate of R550/hr for consulting fees which totaled R88,000 for the month (inclusive). What amount do I use as my basic salary for my payslip, R88,000 or R88,000 excluding vat (R77,192)? Your business will have to pay VAT over to the tax authorities so this VAT amount doesn't really belong to you as a salaried employee. The business should just be collecting it and then paying it over. The VAT amount should therefore not be included in your salary (the money paid to you). So I would use the excluding vat figure of R77,192 as the salary figure for your payslip. Monde sold a pair of shoes for R547,20, inclusive of VAT at 14%. if his mark-up percentage as a percentage of cost is 25%, what is the cost price of the product? If I'm given an exclusive cost price per unit of R2,104, and the inclusive price is R2,398.56, and the markup percentage is 60%, do I calculate the gross profit earned with or without VAT? I know how to do the calculation, I'm just not sure if gross profit includes or excludes VAT. Also, how is a gross margin percentage calculated with the figures given above? 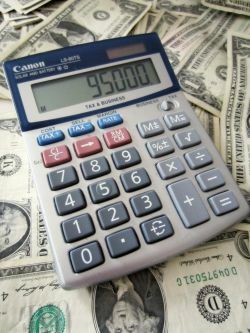 Gross profit is made up of Sales and Cost of Sales. All these things I just mentioned above - every single one of them excludes VAT. So short answer - gross profit always excludes VAT. You need to calculate gross profit without VAT. That last one about calculating gross margin percentage is a tough one! Regarding VAT it is a real refresher. What is the reason for adding the 10% to the actual value of goods when calculating VAT? Because the 10% IS the VAT. The 10% IS the rate of Value Added Tax. The actual value of goods (inventory, purchases, any assets) always excludes VAT. You add VAT because the business has to charge VAT on its sales. The full amount collected in cash is the value of the goods PLUS the VAT added to this. For services rendered on an invoice to a client what would the VAT amount be on R1960 (Rands-South African currency) of 14%? If R1,960 is the full amount on the invoice, then this is the figure INcluding VAT. If I have the item price and selling price how do I work out the percentage? To put it is a very simple way. Great comment Chris! Thank you! How do I know when to use 14/114 if VAT is 14 percent? Use the 114 figure when you're starting from the inclusive figure (cash received, debtors amount, creditors amount, etc.). You say assuming vat is 14% what do you mean by assuming. The fact is vat is 14%. VAT rates change sometimes. Also VAT exists in different countries, not just in one country. Some countries have something similar and call it a sales tax. In South Africa VAT is 14% (I think) but it's different rates in other countries that have VAT or a sales tax. If I only have the VAT amount eggs R1356.52, how do I calculate the exclusive and inclusive amounts. 10% is easy as you only move the dot, and 5% will always be half of any 10%. 10% is actually not always so easy but definitely easier to calculate than say 14%. I'm assuming 10% is the rate and that R1356.52 is just the VAT on the eggs, I hope I understood that right. Exclusive amount is 100/10 X R1356.52. The full inclusive amount is 110/10 X R1356.52. The advocate charged R975 VAT exclusive but here I get R1,111.50 VAT inclusive. Now my question is how did we get that R1,111.50 answer? VAT is based on the R975. If VAT is 14% then it's 14/100 of the R975. We can calculate VAT by saying 14/100 X R975 = R136.50. R975 + R136.50 = R1,111.50. If my VAT rate is 14% and I have purchase price of 48,000 as my Net Price, I understand my Gross price will be 54,720 (48,000 X 1.14 = 48,000). On my study guide there is 6,720. How was this 6,720 derived? I believe the 6,720 was derived from 48,000 X 14%. Hi I would like to know how much would I have to cough out if I want to buy a device that cost 1750 excluding, and how much is it when vat included? You do 1,750 x (100+VAT rate)/100. total amount is rs 468.00 it is including vat. but my question is that 468 x 13.5% is not equal to 468 x 1.135 how it calculate. Take R5,000.00 and times it by 114, then divide it by 14. The total you pay is always the 114 part of the equation I mentioned above. In other words, it is the 100% paid for the product plus the additional 14% VAT added together. How do I calculate backwards...what's the VAT I paid on total of R72,514.34? How do I calculate the inclusive/exclusive price if only the VAT amount is known? E.g. I know I was charged 50 VAT, what is the VAT inclusive price? And VAT exclusive price? Hi all, need assistance. How do I step by step work out vat manually on paper? Going for an interview and I need a crash course. like 7500, how do I put a vat n get a correct answer.